The latest weekly United States Mint numismatic product sales report shows a mostly quiet week. In the absence of any new product releases, collector purchases were primarily focused on the Proof American Silver Eagles and the core annual sets. 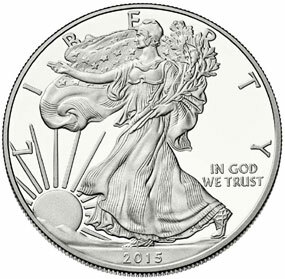 The top selling product by unit volume during the period was the 2015 Proof American Silver Eagle, which added 3,861 units. Cumulative sales have now reached 288,486 units. Close behind in weekly sales was the 2014-dated proof Silver Eagle adding 2,913 units to reach sales of 753,004. The next highest selling products were the 2014 Proof Set adding 2,165 units and the 2014 Silver Proof Set adding 1,231. Moving on to the 50th Anniversary Kennedy Half Dollar products, both the clad two coin set (which is currently out of stock) and the three-quarter ounce gold proof coin showed negative changes for the week. The silver coin collection, which contains four 90% silver half dollars from different mints with different finishes added sales of 916 units. Cumulative sales for the silver coin collection have now reached 196,805 from the adjusted product limit of 225,000 units. Activity should pick up in the next report with the impending release of the 2015 US Marshal Commemorative Coins. The program includes clad half dollars, silver dollars, and $5 gold coins issued to celebrate the 225th anniversary of the Nation’s first Federal law enforcement agency. Sales will open at the United States Mint on January 29 at 12:00 Noon ET. The coins will also be available for sale from the US Mint at the Long Beach Expo held from January 29 to 31. 104 Gold TRs wife? Yeah sure. This basically reverses the -106 seen in last week’s report. Am I correct that the lowest mintage date on all proof gold eagles is 2014? What happened to the Feb. 4th Article. I read it last night and now it is gone?????? Now I just clicked on your site again and the Feb 4 report is back. Must be my computer. Sorry. Sorry to bother you but the Feb 4th report is now completely missing for 4 days now. It keeps coming up with the Jan. 28th report.